Japan has had it's fair share of environmental disasters. Minamata disease is the famous one and the concrete coating of anything that doesn't move has to be up there in more recent times. Reputedly there remains one single navigable river that doesn't sport a concrete lining these days as the country uses four times the amount of the material each year than the US. However one disaster remains little known outside Japan. The Ashio Mining Incident (read "devastation"). 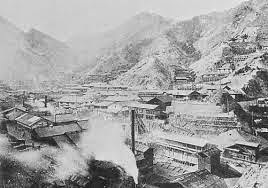 The Ashio mines were a series of copper mines that started to supply the early Shogunate in the seventeenth century. Modest at first, they grew to dominate copper supply in Japan until technology meant they could no longer economically be mined and effectively closed in the early 1800's. As technology improved though they re-opened in the late nineteenth century and again expanded rapidly. Without any form of governmental control the destruction of the local environment began. Pollution from the mines poisoned the fish and the food chain down stream and the demand for timber led to deforestation, reduction in flood protection and the destruction of townships as typhoons ravaged the mountains of Tochigi. Recently the site was visited by the Emperor as a sign of spiritual healing. However the images we saw reminded me of something completely different. 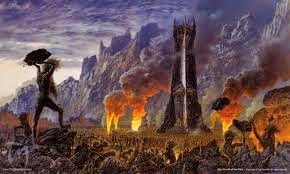 It's really not a difficult jump to go from the mines of Ashio to those of Saruman. The nightmare scenes of the birth of the Uruk Hai really did happen. And it happened at Ashio.